January 6, 2015 – …………. ''AND LET THE FUN BEGIN''……………..
5 Days into the New Year…..Our Park is Almost Full…. These are our names tags that we wear…….Impressive aren’t they…..Hahaha….. Since right after Christmas, it seems the RVs just keep coming in. Lot of them waited till after Christmas and some others after New Years to come down. We are now almost full. Just a few more to come. They all have the same story. It was soooooooooo cold where they came from….Could hardly wait to get here. I remember how excited I was to talk to Debbie from home and tell her how I couldn’t wait to get down here and leave the cold behind. Now I am sitting in that chair and answering the phone and hearing that same story several times a day. lol. How the tables turn………Our street, which is Albatross Dr. is now just one RV away from being full. We have a neighbor coming Feb 1, then our street will be full of 24 spots. Our street is mostly full of motorhomes, fifth wheels and a few permanent park models. All the streets have names of birds. Redbird St. Bobwhite Dr. Whipoorwill Dr. White Dove Dr. Hummingbird Ct. Robin lane, Road Runner Rd. Green Jay St. Blue Jay St. and what name do we have? Albatross Drive…..lol…Just doesn’t seem so Pretty and carefree….lol….Oh Well….But we do have nice neighbors. The weather here has not been the best. It has been raining a lot. The temperature has dropped to the 40s at nite with highs only in the high 50s and 60s. Today ended up a beautiful day and the sun was out and it hit 70…Everyone was out walking or socializing and cooking on the grills…You could just smell the grills cooking up the steaks and pork chops ….Mmmmmmmm…..but sadly tomorrow the temp is dropping. At noon a cold front will be coming in and the temp will drop till in the 30s. Two days of cold and rain….Yuck, but still better than home. I keep up with the weather and travel reports on FB. Illinois is NOT a good place to be right now. We were watching tv when they showed I 80 with chain reaction accidents with all the snow this morning. It was shut down. I said…Rich aren’t you glad your not driving in that anymore?….So I have no right to complain do I….lol….They say several weeks of this and it will start getting better again. Craft class has started today. The lady that was going to do it wasn’t able to make it this year, so my neighbor Lauribeth is conducting them. Today we got together and shared ideas. I brought my mosaic bricks and that will be the first project. They are all excited to be doing something different. So in the next several days I will be going to Home Depot and buying the bricks to begin . Our first class will be a week from Thur. So many things to do all the time. 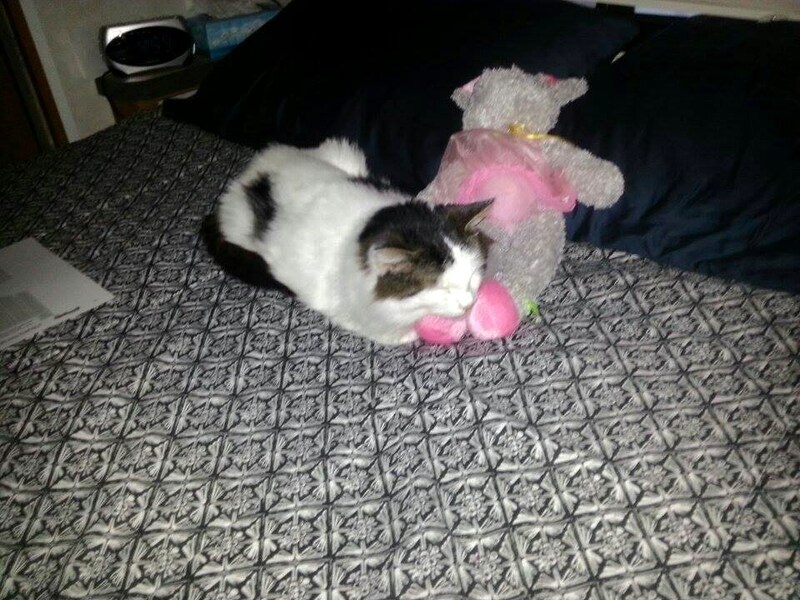 Here is Kitty, sleeping on the mouse that Cassidy put in the camper with the note on it the day we left…..I don’t know what that means…Does he Miss the smells of home as this was in the spare bedroom? or was it just a soft pillow. Kitty is doing so good. He is much more active and playful. He demands attention in the evening. If you don’t pet him he paws at you. His dark brown overstuffed footstool sits next to Rich. He expects it to stay their. He sits their and Rich pets him in the evenings. He is so much more social now. Lauribeth has a beautiful 19 year old pure white Angora. Her cat sleeps in the dash and likes to look out the window. We have tried to get the cats to look at each other, from our windows, but to no avail……….They just don’t care…….We are going to take them both outside one day so they can really meet. We’ll see what happens then. I think they are both just old independent grumpy cats……lol….